Today's thrift style Thursday theme is Gothically Gorgeous - I was so lost at first as to what I as going to do that I could also make appropriate for work. Then I remembered this short sleeve blazer and suddenly I had an outfit. Is it terribly dark? Maybe not, but I think it works pretty well! I am also getting the hang of this camera! I'm pretty dang excited about that - I might even start getting more use of out of it than Nate does, ha! He loves to take pictures when we go on vacations and such, but they often live in the camera for the rest of eternity. It's not as much fun to take an edit them all! I don't make a very good goth - I was far from goth in high school. I was the geek - the band geek, the choir geek, the drama geek. I wrote for the paper. I was the total geek who was just a slight bit preppy. Yet both Nate and I had some friends that probably qualified as goth. We kind of didn't care who we hung out with, most geeks really don't, he he. 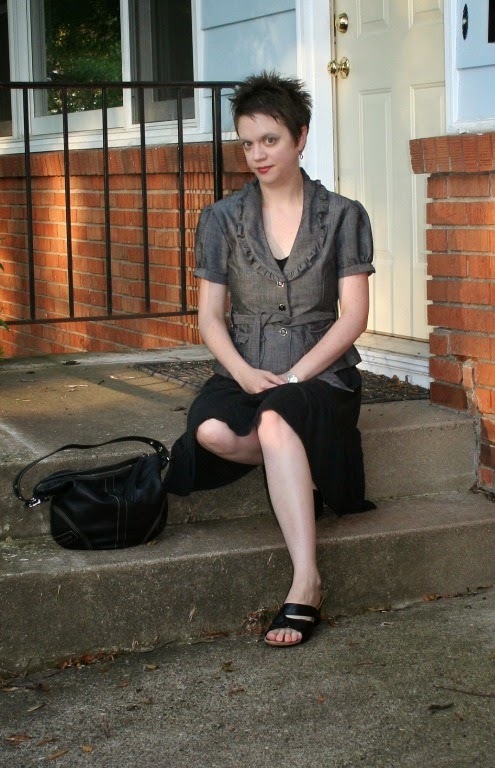 Be sure to check out my other Thrift Style Thursday cohorts at their blogs listed below! I like your take on the Gothic style. I love that blazer! It's like preppy goth! I like it. Great outfit - love the fit on the blazer. That short sleeved blazer is so cute on you! Have fun using the camera! Nice job this week, I definitely struggled with it but you did an awesome job! Also, the photos really are lovely, I love when you can see improvement in your ability to use a camera through blog pictures! It's cute! I love your hair! I am missing my pixie cut now! That is goth at the office perfection! =O) *Your make-up is fab too! I love this look--what a cute blazer! Yeah, I was pretty much the opposite of goth too. Lots of pink. Girly stuff. Pretty much the anti-goth. But I also had some goth-leaning friends. I like this version of gothic - it looks great! :) I don't even know where I would start if I put together this kind of inspired outfit!